As this series has already shown us, ornithological nomenclature is often a game of utter nepotism. Got a buddy whose birthday you forgot? Thinking about hitting someone up for a loan? Name a bird after them to butter them up! I’m pretty sure that both Machiavelli and Miss Manners have discussed the issue at length. 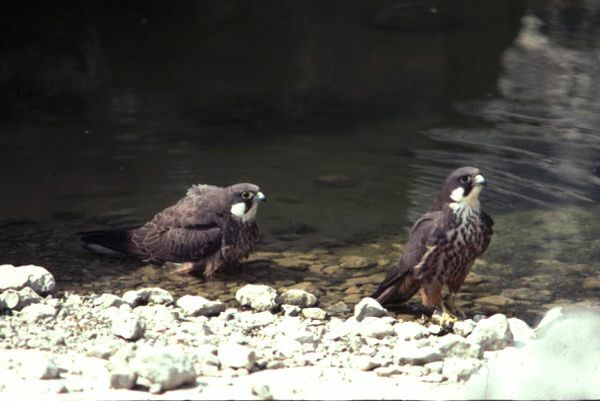 So when I mentioned the Eleonora’s Falcon in my last post, you may have assumed that the name was a mother’s day present, or an engagement gift from some impecunious ornithologist who couldn’t afford a ring. I am pleased to report that this is not so! In fact, the Eleonora’s Falcon is named after a little-known heroine from a little-known island – a woman of such talent and skill that she richly deserves to be remembered in the form of an eerily clever bird. Eleonora of Arborea was the judge (effectively, the queen) of Arborea, which she expanded until it encompassed most of the island of Sardinia, from 1383 to 1404. Sardinia is an odd place which holds a special place in my heart as the site of my life Greater Flamingo and many other good memories). She is considered a Sardinian heroine even to this day – possibly because her reign was the last golden age, and after her death Sardinia lost its independence in short order. She created a constitution which was relatively progressive for its time. She also had an interest in ornithology – in particular, she banned the hunting of falcons. This may have been a move on her part to ensure that falcon possession was restricted to favored nobles, but even if so, that only puts her on par with Theodore Roosevelt. A unique bird named for a unique woman. What could be better than that?